Customise your router table with UJK Technology. Your router table should reflect the work that you do. As a unique Axminster brand, UJK Technology’s wide range of routing products help you to build your dream router table. Whether you are just starting out in woodworking or are a seasoned pro, we’re here to help you bring your vision to life! For the ultimate workshop router table, our floor standing options are the ideal choice. With a cast iron top, this premium top absorbs vibration for more efficient working. The quality of the surface grinding on the 815 x 615 x 40mm top is superb, offering little resistance when passing stock across the table during use. The aperture in the table top is designed to accept our UJK Technology Router Elevator. When fitted with this unit, you will have an excellent and versatile set up. The UJK Technology Professional Leg Stand is of sturdy construction with a foot operated retractable castor for excellent mobility around the workshop. 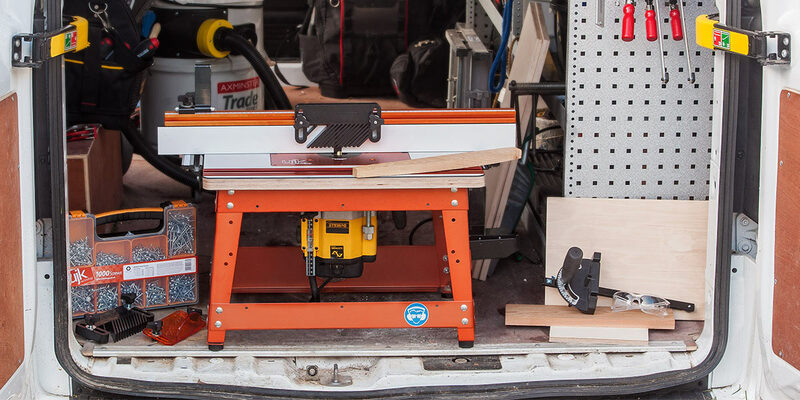 A neat rack is provided for keeping your most popular router cutters to hand. Finally, provision is made for storage of the supplied mitre fence assembly. In all, this professional table is full of great features to allow you to carry out both simple and complex routing operations. A great value for money package deal. It comprises several items including UJK Technology Professional Laminated Router Table Top, UJK Technology Professional Router Table Fence and UJK Technology Professional Router Table Leg Stand. Ideal for bench top or site work, our compact router tables tick all the boxes. Both options are supplied with a router fence, mitre fence and leg stand. Also available is the leg stand only. For convenience, both options will accept the UJK Technology Router Elevator as well as any of the router table inserts. This router table with cast iron top is a solid, dependable unit that will give many years of useful service. The cast iron top is a great option where stability and vibration damping are essential. 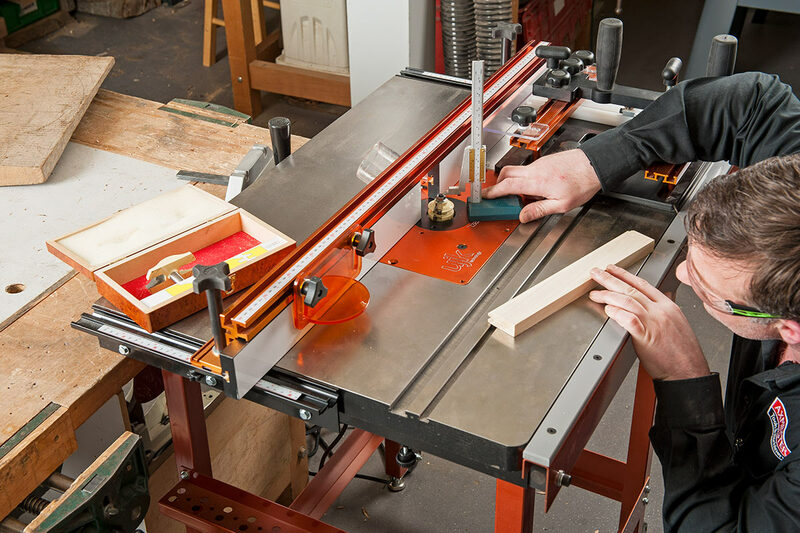 What’s more, there’s little resistance when passing stock across the router table during use. Finally, the quality of the surface grinding top is excellent. The cast iron top is also available separately. Made of high grade birch ply with hard wearing, low friction phenolic laminate, the worktop router table ensures workpieces glide smoothly. Ideal if your workshop is suffering from damp, the ply core ensures the top remains flat throughout its working life. It measures 600mm x 400mm. Again, the laminated router top is also available separately. Next, after you’ve assembled your router table you’ll need to fit the insert plate. Our 10mm aluminium pre-drilled option accommodates many different types of router. It’s quicker to set up as it comes with a circular universal base attached to the underside of the plate. This makes for easier router mounting which means you’ll enjoy more efficient working and save time along the way. Alternatively, the UJK Technology 6mm Aluminium Router Table Insert Plate is also very good as you don’t lose too much cutter height. 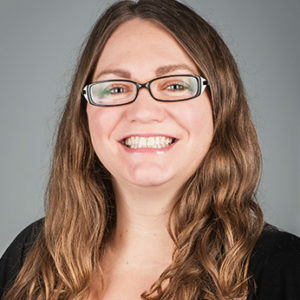 Using a heavy ½” router? 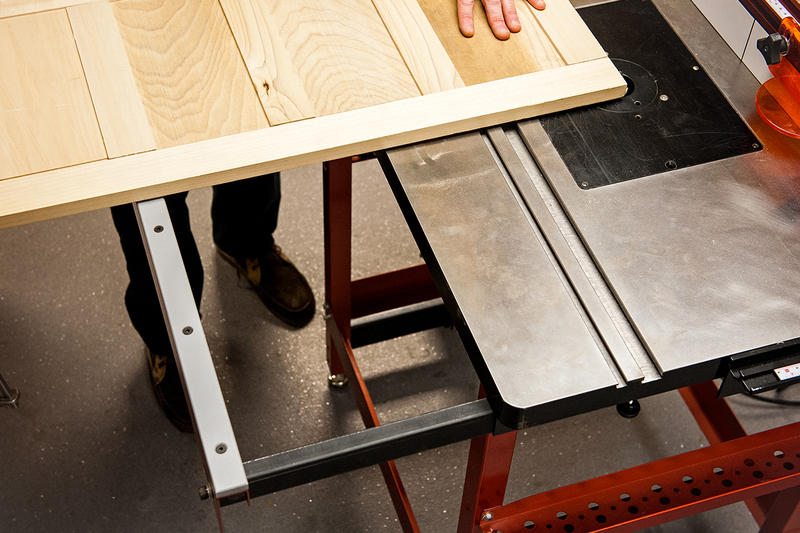 Our phenolic 10mm router table insert offers a very substantial mounting for your router. Made from hard plastic, it will hold its shape. It has a blank base underneath so you will need to drill it to fit your router. For convenience, there is a centring guide template that tells you how to drill it. Ideally this should be in a pillar drill. Fitting straight into all UJK Technology router tables, our UJK Router Elevator allows fast accurate height adjustment from above the table. For convenience, there’s a universal base to accept different routers. One of the greatest advantages of the elevator is that it allows you to adjust the height of the cutter from above the table. This is a great time saver if you regularly change the depth of cut. If you think the elevator could be suitable, why not pop into one of our Axminster stores and see it for yourself? Please note: if your router fits the 10mm aluminium option it doesn’t necessarily mean it will fit the elevator. If you have any queries about this please speak to our technical department who will be more than happy to help. The UJK Technology NVR Switch clamps directly to the leg stand of our UJK Professional router tables. Supplied with 2m of cable with a moulded 13A plug and a steel clamping bracket, it provides an independent switching arrangement for your router. It offers the protection of No Voltage Release. This means that if the power fails, the circuit breaker opens and the motor will not restart when the power is restored. With a protected 13A socket, it is perhaps the safest way to use your router in a table. For safety purposes, you’ll need to be able to “latch” your router’s switch in the “on” position. An excellent device for stopped chamfers or rebates, this quick stop fits all UJK Technology router tables. 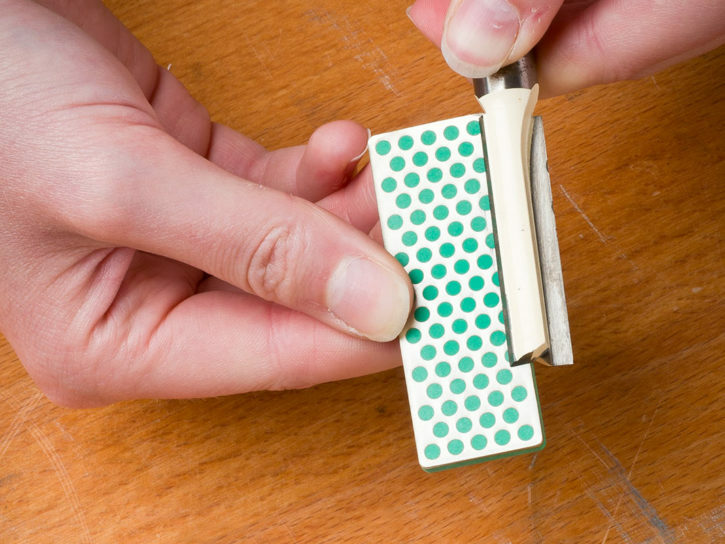 It is very useful for repeat cuts, making it ideal for small box making. For ease of use, it is simple to attach to the top of your router table fence. When not in use, it simply flips up out of the way. This handy piece of kit is a great alternative to clamping and then removing temporary blocks. 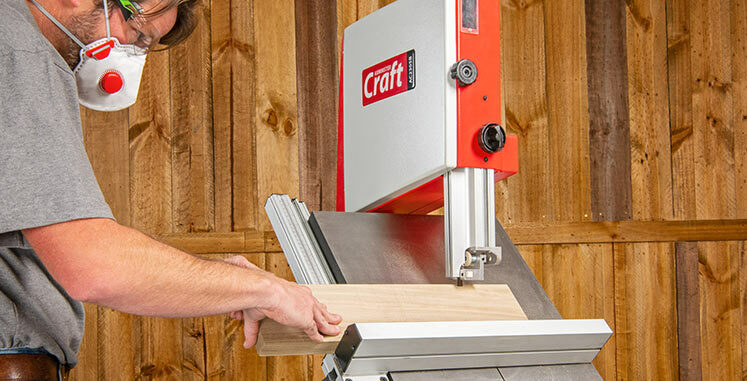 An excellent addition to any UJK Technology Pro or Compact router table. It is also suitable to fit to other custom made tables of your own design. The 100mm diameter outlet on the back also incorporates a 62mm inlet and hose which enables extraction from both above and below the table simultaneously. Adjustments to your router can be made via an access door at the front, complete with magnetic closure. Keep your fingers safe and minimise movement with these high quality featherboards. Designed to hold the wood against the fence and the table, they help to ensure that your workpiece doesn’t move about when routing. With adjustable, anti kickback fingers which act as springs, the chance of injury is greatly reduced. Movement or bounce back is also significantly reduced but it is advisable to set up a number of featherboards against the table and the fence for safety purposes. An excellent accessory for safer routing, these vertical featherboards simply attach to your router table fence with the supplied T bolts. For safer and more efficient working, they provide extra support for the workpiece as it is being passed across the cutter. What’s more, the amount of applied pressure is sustained over a wide area. 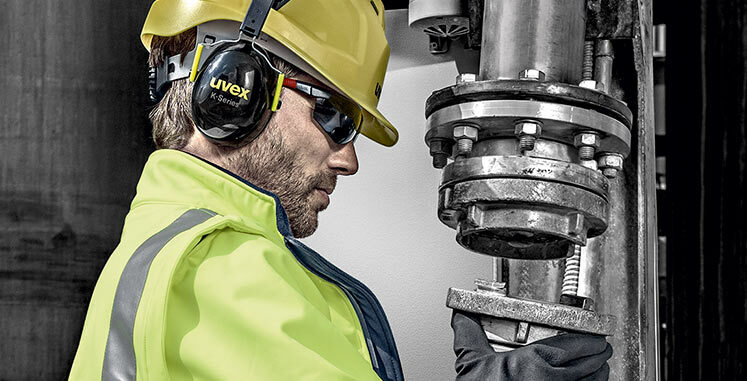 This means you are less likely to experience chatter or breakout on the workpiece. For safety reasons, they should be positioned either side of the cutter offering downward pressure on both the infeed and outfeed sides of the table. Available in a variety of useful sizes and also as a blank insert so you can create your own custom hole size, these router table inserts are safe and stable to use. They provide greater stability across your router table and also help to reduce the hole size. In turn, this improves the extraction. 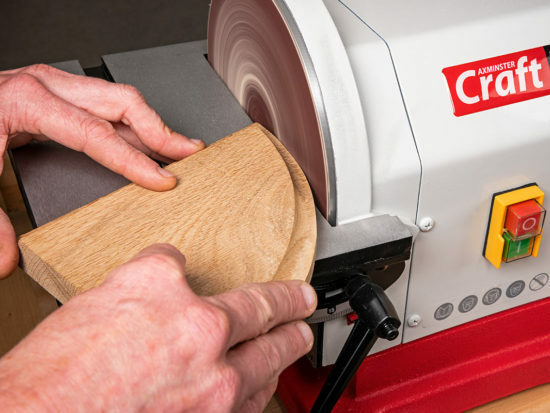 From a safety perspective, it is important to select the insert disc depending on the size of the router cutter you are using. This will ensure greatest levels of safety and and significantly reduce the likelihood of wood chips flying about. Whether you are carrying out template or inlay work, this is an essential set for your router. For convenience, these bushes fit most UK routers. All that is required is the addition of a threaded guide bush adaptor. Simply select the correct adaptor for your router and you’ll enjoy the accuracy and precision of this invaluable set. Highly accurate, this guide bush set will fit many router table insert plates that have a stepped central hole to accommodate them. Neatly contained in a robust storage case, the set includes 10, 12, 14, 16, 18, 20, 24 and 30mm guide bushes along with a locking ring. These adjusters are a great accessory for the UJK Technology router tables. They allow you to finely adjust the fence as required. Simply add them to the fence locking knobs and add fine adjustment via the thumb wheel. Once adjusted the fence is then locked in place and ready to use. These H-section extrusions fit behind the outfeed fence of the UJK Technology router table fence. They enable you to achieve an exact 1mm offset between the infeed and outfeed fences once in position. Furthermore, their clever design means you can rotate each extrusion by 180° and reinsert them in position to achieve an exact 2mm offset. Supplied as a pair. 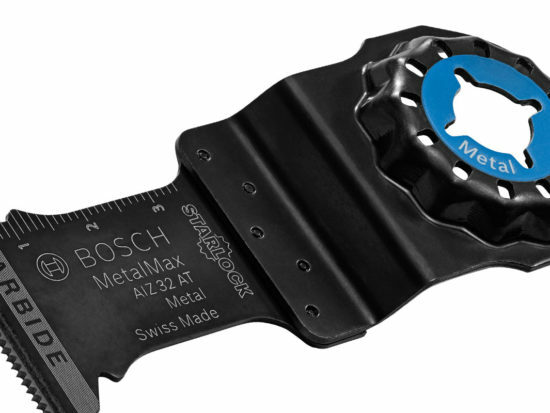 This extension provides vital extra support when machining wide workpieces. It is ideal for raised panels on cupboard doors. Fixing is just a simple matter of attaching a bracket on either side, on the underside of the table using 3 cap head screws per side. The extension slides in and out of the brackets on strong rectangular section bars. 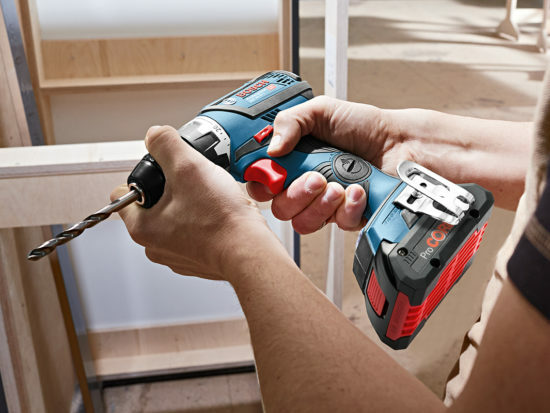 Going from zero to 260mm, at its maximum, it effectively gives you approximately 610mm from the centre of the router cutter to the edge of the extension. The top edge of the extension is a low friction material, ensuring that your work glides smoothly. Made specifically for the UJK Technology Professional Router Table, it is 810mm in length, running along the entire front edge of the table. If you want your router cutters to last longer it is essential that you maintain them. Regular router bit care and maintenance will help to provide years of trouble free service; a little bit of TLC really does go a long way! Read our helpful Router Bit Care Insight. Alternatively, we have interesting articles focusing on Router Table Accessories as well as some handpicked Router Cutters to grow your collection. 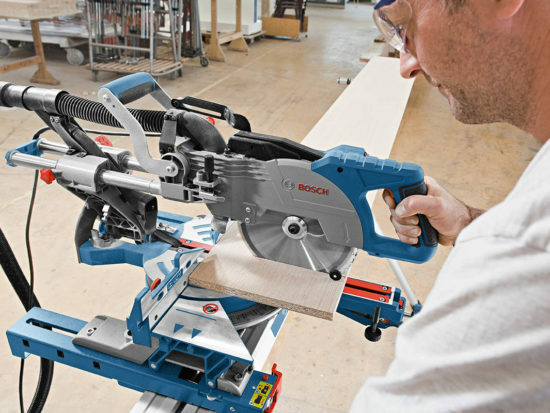 Finding the right router cutter for the job can be a minefield. Here at Axminster, we share your passion for routing so why not take a look at the router cutter options available, both online and in store? We’d love to hear from you. Comment below or send us a photograph and tell us all about your router table setup. What do you love about it, and why? Alternatively, get in touch via our social media platforms. Find us on Facebook, send us a tweet or tag using on Instagram using #routertable to @AxminsterTools.